The reality is, we don’t know as much about the Heretaunga and Ruataniwha aquifers as we thought we did. 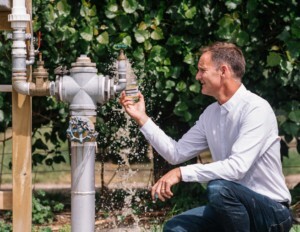 While the Hawke’s Bay Regional Council claims a good understanding of how the aquifer works it’s not as clear about certain groundwater pathways, interactions with streams and rivers and susceptibility to contamination. In an effort to stop us treating groundwater as an endless resource it’s no longer issuing new consents for large groundwater extractions and has commissioned a survey using ground breaking hi-tech aerial electromagnetic (AEM) technology to better understand the vulnerabilities. Over the past decade our water supply has become front of mind through droughts threatening the great things that grow here and the 2016 Havelock North water crisis and its flow-on effects across the country. There’s been huge investment in infrastructure, monitoring and treatment and now with concerns about river flows and groundwater levels, we urgently need more accurate data to inform long term planning for sustainable irrigation, development and residential supply. We’re told two thirds of Earth’s surface is covered by water — 97% of it in the oceans. The remaining three percent of non-salt water is frozen or in rivers, lakes, streams and underground aquifers which provides 30% of our drinking water. Dr Smith says the Havelock North drinking water contamination event was “at least partly a consequence of poorly understood aquifer complexity”. It’s already unsafe to drink local water in many parts of the world because of infrastructure failure or contaminated sources, and the only winners are booming bottled-water businesses. Demand is only going to increase as the level of wells and rivers gets lower and, in some places, dries up, pushing water value skyward. A recent NASA study suggests one third of the Earth’s largest groundwater basins are over-exploited with water being removed from 21 of the 37 largest aquifers faster than it can be replenished by rain and snow. The Regional Council’s principal scientist Dr Jeff Smith says SkyTEM survey technology is being deployed because past efforts to map the capacity, security and safety of our groundwater and aquifer resources have proven inadequate. In fact, he says, existing knowledge of parts of the aquifer systems may be inaccurate, with potentially “environmentally-damaging and commercially-restricting” outcomes when it comes to water management decisions. That’s certainly the case at deeper levels or when information on small-scale pathways is required over larger areas in more complex geological settings. While the council has made significant progress in recent years; its model for the Heretaunga Plains aquifer system being recognised as a finalist in the 2018 Local Government New Zealand Excellence Awards, more detail is now needed. The main concern is that our groundwater, which moves through a body of permeable and porous saturated rock and intricate networks of buried river channels hidden in our aquifers, is more complex than previously understood. One of the key triggers for the new survey was a GNS Science investigation into water age and the source of the Heretaunga Plains groundwater which revealed “the aquifer system is much more heterogeneous than previously thought,” says Smith. Council scientists need high-resolution data to look into the variability of aquifer sources and properties and to determine changes in flow paths and the impacts of groundwater pumping. Over six weeks in the summer of 2019-20 SkyTEM tools will be deployed during an intense helicopter flyby going deeper and wider than has previously been possible. The estimated $2 million project will identify where water sources originate, intersect and merge; the potential for contamination, and ways to protect existing and potential drinking water supplies. Costs include $6000 a day for the technology, the helicopter and a crew from Perth. Funding is covered in the council’s 10-year Long Term Plan (LTP). underground pipe networks, may interfere with electromagnetic data collection. The SkyTEM rigid hanging frame, to be choppered around the region, will carry an array of ancillary sensors including a magnetometer, laser altimeters, video cameras and GPS equipment. 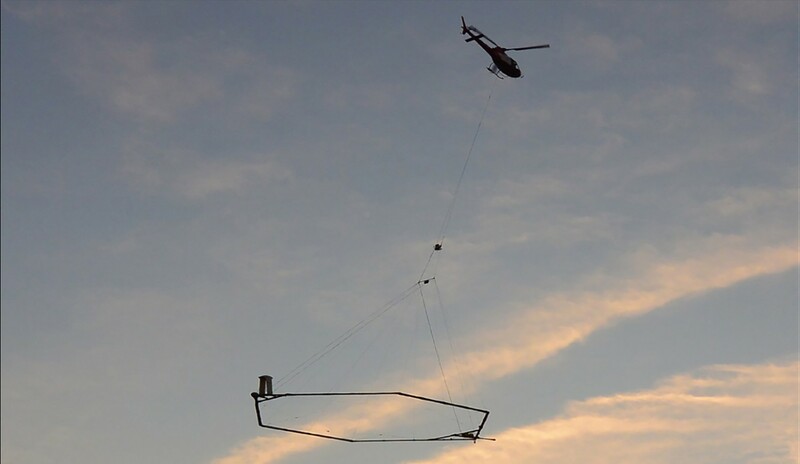 SkyTEM has a Dual Moment transmitter that allows for collection of accurate images from both shallow and deep geology with a low-noise receiver to detect subtle geological changes. It’s geared to stay calibrated throughout data acquisition. In the first stage the survey will fly 2000 km throughout the Heretaunga aquifer system with the first reports available within six weeks of fieldwork being completed. Previously gathering groundwater data was a boring process. In fact, it required many bores, but they weren’t deep enough to deliver the kind of data HBRC needs to confidently futureproof its understanding of ‘hydrological flow paths’. Dr Smith says little was known about the deeper aquifer system with “sparse drilling logs from relatively shallow bores insufficient for capturing the different sources and small pathways that make up the system”. SkyTEM, launched in 2004 can do this at a much lower cost than a deep-drilling programme. It was previously used in oil exploration, then advanced by the Danish government and universities to map groundwater resources and map large aquifer systems in Denmark, Netherlands, India, China, US and Canada. It’s capable of identifying subtle changes between sand, clay, silt, gravel and tills that define the location and potential vulnerability of groundwater resources. The survey will probe to depths at least 300 metres below ground level and in some cases down to 450 metres with line spacing of 200 metres and sounding intervals at 11 metres. “This will provide a spatially dense dataset from approximately 2000 line-kilometres of flying throughout the Heretaunga Plains,” says Dr Smith. The second stage will map the Ruataniwha aquifer. The highly detailed 3D hydro-geological models will give a much clearer picture of groundwater and surface water interaction, the extent of deep groundwater resources and the boundaries that define recharge areas in confined and semi-confined areas. Once the data is analysed and developed into smart modelling tools, council scientists will have a more accurate flow model to plan for future contingencies such as river flow, droughts, contamination alerts and potential leaching into the aquifers. The SkyTEM solution aligns with the councils 2017-2021 Strategic Plan requiring water to be allocated sustainably based on its highest value as well as identifying outstanding freshwater bodies and better understanding the trends and risks for each catchment. Dr Smith says the modelling will identify vulnerability to contamination from land-use activities and discharges to groundwater “reducing the uncertainty of transport model predictions that might show areas that are sensitive to being impacted by outside sources and pathogens”. HBRC is working with stakeholders in high-risk areas to ensure efficient water use while exploring alternative sources, including managing the effects of intensive land use and irrigation and creating groundwater protection zones to prevent contamination. GNS Science will interpret the data and develop the 3D hydro-geological model. In 2020, a 3D “pathogenic transport model” will be developed so scientists can use the software for “rapid and robust upscaling and downscaling” to build and calibrate models based on shifts or changes detected. By the end of this stage the new Heretaunga groundwater flow model will be available to inform the implementation of the TANK Plan Change and by 2020-2021 the tools will be able to assess “risks of pathogenic contamination and source protection areas”. In the meantime, we’ll have to rely on existing data and science until the new model can more accurately plumb the mysteries of the deep aquifer and its groundwater properties.